The goal of the Fairfield City School District Transportation Department is to provide safe and effective pupil transportation service. It is our commitment to students and parents that they will experience a high level of customer service from the staff members of the transportation department. The bus stop will usually be found at a cross street or corner. In order to operate safely, the buses will not usually enter cul-de-sacs or dead-end streets, except to transport students with special needs as required by state law. We want to maintain as safe an operation as possible by minimizing backing up and turning around. It is important for parents to recognize that the Ohio Pupil Transportation guidelines provide that students may walk up to one-half mile to a designated bus stop (3301-83-13). The Fairfield City School District is committed to providing bus service equal to or better than this state standard. The Fairfield City School District respects the partnership with the parents of the district that is required to allow all students to have a safe, pleasant transportation experience. The district is responsible for students once they board the bus, while parents maintain the responsibility for the safety and supervision of their children to and from the bus stop and while waiting for the bus in the designated place of safety as assigned by the bus driver. Students should respect other individuals, their possessions and property, and follow appropriate safety procedures. The Fairfield City School District Transportation Department is committed to ensuring that all students are transported in a safe and responsible manner. Please contact the Transportation Office if we can help improve our service to you. Please review the Guidelines for Determining Driver-Designated Place of Safety, as specified by Chapter 3301-83 of the administrative code, which regulates pupil transportation in Ohio. Students should arrive at the bus stop five minutes early and wait in the designated safety zone (20 paces away from the bus) which is designated by the bus driver and shown in the photo below. Students disembarking the bus are not to proceed to their residence until the school bus has departed. In this case the standard of teaching, developed within the preservice program that all drivers are required to participate in as "best practice," is the students are not to proceed to their residence until the tail lights of the school bus are visible to the student. 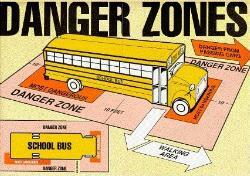 These rules pertain to both safety and administrative procedures for pupil transportation. Compliance with these rules is mandated under Ohio Revised Code 4511.76. You can access the guidelines from the file list below.